The first is a new animation brush that allows you to stretch/shrink any area of the picture. With this new tool you can, for example, animate breath. 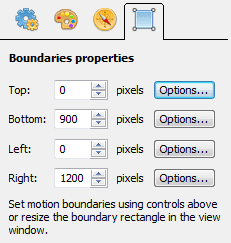 The second new feature is set of controls for animation bounds. 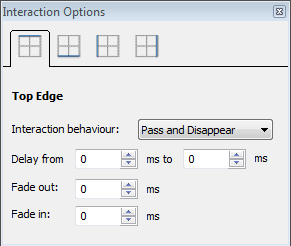 Now you can set how objects will move when they reach the edge of the bounding area, as well as timings and fade in/out options. Later we’ll publish a set of articles explaining the new features in detail. This new brush has a nice effect. Good update. had to say this lol…bet you guys had fun animating THIS one heehee!!!! All animated objects just repeat even if I choose ‘Pass and Disappear’. Maybe I’m doing something wrong? A few articles about bounding controls will be published soon. That would be great – thanks Firefly! Looking forward to seeing what I’m doing wrong! The possibilities atisticas of these programs are very important. I put you a file on the smile of the Gioconda that had done Leonardo’s delights. In format asw so that you could change it to your taste. Of course they do not exist any copyright and the image is politically correct from what I would like they were adding it to the tests. Las posibilidades atisticas de estos programas son muy importantes. Os pongo un archivo sobre la sonrisa de la Gioconda que hubiera hecho las delicias de Leonardo. En formato asw para que podais cambiarlo a vuestro gusto. Por supuesto no existen ningun derecho de autor y la imagen es politicamente correcta por lo que me gustaría la añadieran a las pruebas. Nice effect. I`m glad that your program is walking foward. Blessings!